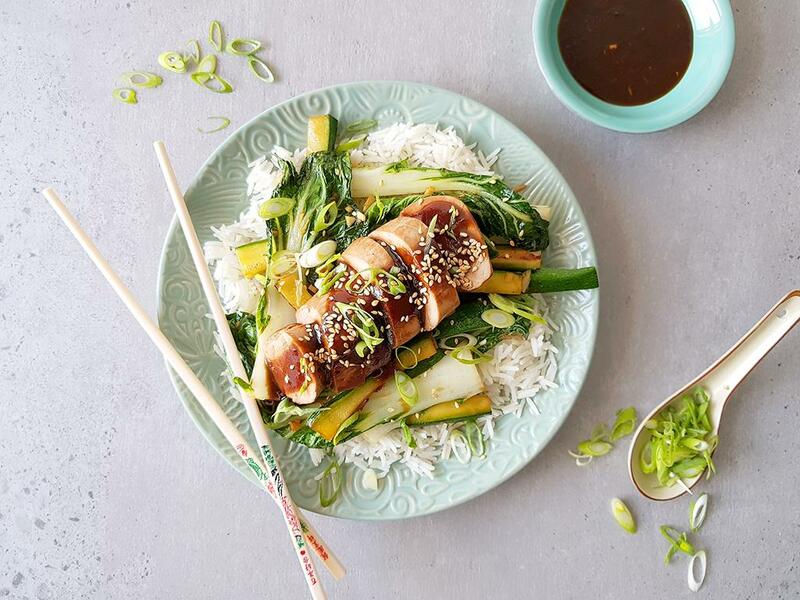 Hoisin pork fillet with saucy stir-fried pak choi & courgettes topped with sesame seeds, on a bed of rice. Brown rice: : Boil the kettle. Pour boiling water (¾ cup for 1) into a pot on high heat and add the rice with a pinch of salt. Bring to the boil, cover, turn heat down to low and gently simmer for 18-20 minutes. Drain. 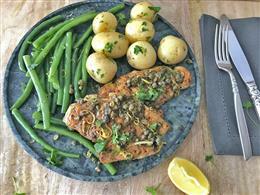 Pork fillet: Place a pan on medium-high heat with a drizzle of olive oil. When hot, brown the fillet for 4-5 minutes. Then place in the oven and cook for another 5 minutes. Season with salt and pepper. Hoisin bean sauce: Mix together the chilli bean paste and hoisin sauce and thin it out with a little water (½ tbsp for 1). Use half the quantity of the sauce for this recipe, just add more to taste. Oyster soy sauce: In a separate bowl, mix together the soy sauce, garlic and oyster sauce. Set aside. 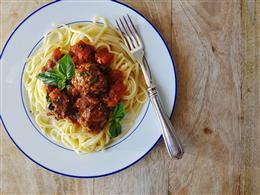 Use half the quantity of the sauce for this recipe, just add more to taste. Veggies: Using the same pan you used for the pork fillet, on high heat, sauté the courgettes and pak choi stalks for 3 minutes. Then add the pak choi leaves and oyster soy sauce and cook for another 2-3 minutes until wilted and cooked. Serve the rice topped with the fillet, veggies and hoisin bean sauce. Sprinkle over the toasted sesame seeds and spring onions. "It was a very enjoyable meal and loved the Asian flavours. Definitely something that I would cook again."